The deltaDNA campaign system can send push notification messages to your players via Urban Airship, if you already have them integrated in to your game. deltaDNA Engage campaigns will instruct Urban Airship when to send individual messages to players and report on message delivery, opens etc..
Clicking on the Create button in the Urban Airship Actions panel at the top of the Actions Management page will take you to a form that lets you create a new, reusable Urban Airship push notification message action. Clone an existing action to a new action. Handy if you are setting up multiple similar actions. This Action panel will become familiar as it is used by all the action management screens. You will need your own Urban Airship messaging account and configure it to send notifications to your players via Urban Airship. The Urban Airship Message Content will let you chose a message template from your Urban Airship account. If you get an error message at the top of this page, it indicates that you haven’t configured and connected your Urban Airship account correctly. You can use the Refresh Button to reload the message template list from your Urban Airship account. When you have chosen a template from the drop down list press the Select Button to load the message template in to deltaDNA. Your message template will be loaded from Urban Airship and a panel showing it’s contents as JSON will be displayed. You can’t edit this here, it is simply to let you check the template contents. If you do wish to edit the template, you should do so in Urban Airship. The Change button will take you back to the template selection screen to choose a different template. 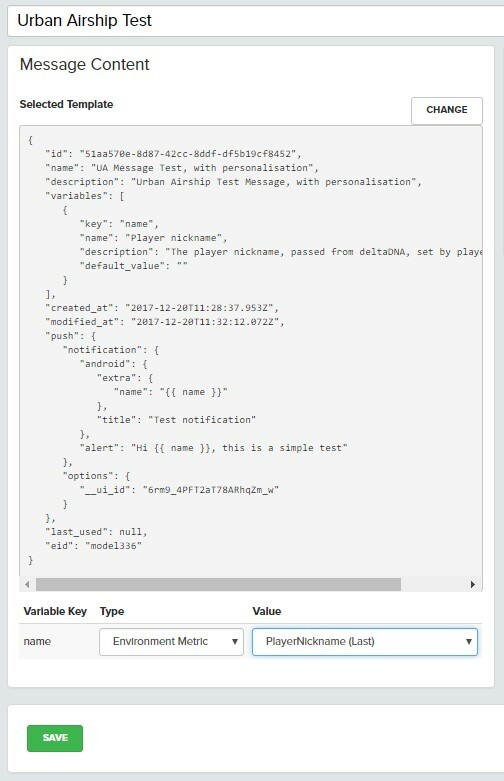 Any parameters that you have specified in the Urban Airship template builder, to personalize the message text or notification payload with dynamic content, will be shown below the template JSON panel. You can then select the values you wish to substitute in to these slots. Each dynamic field will need a placeholder that acts as the substitution text in your notification template. 3) A Variant Property that lets you dynamically alter content for each variant group in a campaign. Variant A – Here’s a new Tommy Gun to help you in Robbers missions. Don’t forget to click the Save button when you have finished configuring your Urban Airship Notification. Your action will now be available to use in Out of Game Campaigns. NB : Your game will be responsible for reacting to any custom parameters you put in the payload, so some planning and instrumentation is required when your developers are integrating with deltaDNA and planning your event collection and engagement specification.